Rosh Hashanah falls on September 28, and Yom Kippur is on October 7. I wish my Jewish friends every happiness and blessing of this holy time, and I hope that 5772 will be a very good year for you. 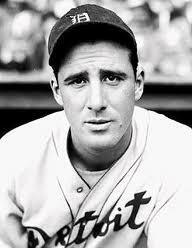 Hank Greenberg was a baseball player. A team leader. A league leader. A Jew. Both Rosh Hashanah and Yom Kippur fall in the regular season and in 1934 Greenberg’s Detroit Tigers were involved in the pennant race. Greenberg’s rabbi said that Rosh Hashanah was a “festive holiday” and playing would be acceptable. Hank played and hit two home runs including a ninth inning game winner. Author: Edgar Guest. Published in Detroit Free Press, 1934. Said Murphy to Mulrooney, ‘We shall lose the game today! September 17 is Constitution Day in America, a time to celebrate history’s greatest document this side of the Ten Commandments. Let’s not forget Gouverneur Morris, who gets an “A+” for that masterful work of composition. Constitution Day deserves much more attention and appreciation than it now receives. So too does Mr. Morris, who has been relegated to the back benches of the Founding Fathers. “The Penman of the Constitution,” he deserves better. A native of New York City and a gifted scholar, Morris enrolled in 1764 at the age of twelve at King’s College, predecessor to Columbia University in New York City. He graduated at age 16 in 1768 and received a master’s degree in 1771. Morris represented Pennsylvania in the Constitutional Convention of 1787. Morris was a signatory to the Articles of Confederation. He saw and lived with the weaknesses of the new nation’s first attempt at self-government, and did his part to rectify them the second time around. Morris was an author of large sections of the Constitution of the United States and one of its signers. He is widely credited as the author of the document’s preamble: “We the People of the United States, in order to form a more perfect union …” That was still an era when most Americans thought of themselves as citizens of their respective states. Morris advanced the idea of being a citizen of a single union of states. Born to a wealthy family in Westchester County, he was elected in 1775 to represent his family estate in the New York Provincial Congress. After the Battle of Long Island in August 1776, the British seized New York City and his family’s estate across the Harlem River from Manhattan. His mother, a loyalist, gave the estate to the British for military use. Morris was a member of the New York State Assembly in 1777-78 and was appointed as a delegate to the Continental Congress, and took his seat in Congress on 28 January 1778. He was selected to a committee in charge of coordinating reforms of the military with George Washington. After witnessing the army encamped at Valley Forge, he was so appalled by the conditions of the troops that he became the spokesman for the Continental Army in Congress, and subsequently helped enact substantial reforms in its training, methods, and financing. He also signed the Articles of Confederation in 1778. In 1779, he was defeated for re-election to Congress, largely because his advocacy of a strong central government was at odds with the decentralist views prevalent in New York. Defeated in his home state, he moved to Philadelphia to work as a lawyer and merchant. 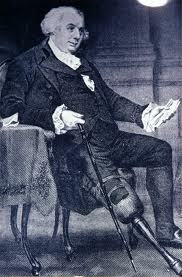 In 1780, Morris’s left leg was shattered and replaced with a wooden pegleg. Morris’s public account for the loss of his leg was that it happened in a carriage accident, but there is evidence that this was a false story concocted to cover for a dalliance with a woman, during which he jumped from a window to escape a jealous husband. Morris was well-known throughout much of his life for having many affairs, with both married and unmarried women, and he recorded many of these adventures and misadventures in his diary. Before the Constitutional Convention, Morris lived in Philadelphia where he worked as a merchant for some time. The financier Robert Morris (no relation), recommended him for the convention. During the Philadelphia Convention, he was a friend and ally of George Washington and others who favored a strong central government. Morris was elected to serve on a committee of five (chaired by William Samuel Johnson) who drafted the final language of the proposed constitution. Catherine Drinker Bowen, in Miracle at Philadelphia, called Morris the committee’s “amanuensis,” meaning that it was his pen that was responsible for most of the draft, as well as its final polished form. “An aristocrat to the core,” Morris believed that “there never was, nor ever will be a civilized Society without an Aristocracy”. He also thought that common people were incapable of self-government because he feared that the poor would sell their votes to the rich. Consequently, he thought that voting should be restricted to property owners. Morris also opposed admitting new western states on an equal basis with the existing eastern states, fearing that the interior wilderness could not furnish “enlightened” statesmen to the country. At the convention he gave more speeches than any other delegate, a total of 173. He believed strongly in a guiding god and in morality as taught through religion. Nonetheless, he did not have much patience for any established religion. As a matter of principle, he often vigorously defended the right of anyone to practice his chosen religion without interference, and he argued to include such language in the Constitution. Morris went to France on business in 1789 and served as Minister Plenipotentiary to France from 1792 to 1794. His diaries during that time have become a valuable chronicle of the French Revolution, capturing much of the turbulence and violence of that era, as well as documenting his affairs with women there. Mr. Morris with pegleg after his unfortunate "accident." He returned to the United States in 1798, and he was elected in April 1800, as a Federalist, to the United States Senate, filling the vacancy caused by the resignation of James Watson. He was defeated for re-election in February 1803. At the age of 57, he married Anne Cary (“Nancy”) Randolph, who was the sister of Thomas Mann Randolph, Jr., husband of Thomas Jefferson’s daughter, Martha Jefferson Randolph. Morris also established himself as an important landowner in northern New York, where the Town of Gouverneur and Village of Gouverneur in St. Lawrence County are named for him. He died at the family estate, Morrisania, and was buried at St. Ann’s Church in the The Bronx. This distinguished, aristocratic man died an unusual and painful death in 1816. He stuck a piece of whale bone through his urinary tract in an attempt to relieve a blockage. So it’s Constitution Day, a time to celebrate history’s greatest document this side of the Ten Commandments. Let’s not forget the Constitution’s Penman, who gets an “A+” for his masterful composition. In writing my blog and posting on Facebook I have tried to avoid the political realm. This time I would like to make an exception. The Bret Stephens column in the Wall Street Journal of September 6, 2011 struck a chord with me. I think that his central point is worth repeating here, and pondering as we look back on September 11, 2001. That day has its own sobering meaning for me; I flew out of Boston early that morning to attend a trade show in Atlanta. I began the day one airline terminal distant from the mass murderers. He also rightly points out that while 9/11 was a day of monumental loss, it was also a day of extraordinary love and giving. He cites the first responders, the heroic and courageous “Let’s roll” passengers of Flight 93, the volunteers, emergency crews, and those inside the buildings who helped others and managed to save individual lives. Earlier, on my Facebook page, I posted a link to ESPN’s beautiful story of the man in the red bandanna, Welles Crowther, Boston College lacrosse player. He is credited with saving at least a dozen people that day. If you have not yet seen it, find it on YouTube. Stephens says that our remembrance of September 11 should largely be to reflect on, and be thankful for, those selfless people. Agree. If we all strive to emulate them, in ways large and small, our world will be a better place. He goes on to remind us of a deeper danger here, and I believe he’s correct. He compares the September 11 attack to the one on Pearl Harbor. In 1941, a comparable number of Americans lost their lives. While the nation mourned, it also responded. The day became a “bookend” in a war that was fought with a clear purpose and righteous resolve. But 9/11 is an event that has no corresponding bookend; we don’t know whether we’re early, late, or somewhere in between in a similar book. In short, 9/11 has become an event unto itself, somehow disconnected from everything that still flows around it. “There is something dangerous about this. Dangerous because we risk losing sight of what brought 9/11 about. Dangerous because nations should not send men to war in far-flung places to avenge an outrage and then decide, mid-course, that the outrage and the war are two separate things. Dangerous above all because nations define themselves through the meanings they attach to memories, and 9/11 remains, 10 years on, a memory without a settled meaning. Once again, I agree. American greatness does not reside in its presidents, congress people, actors, CEOs, or athletes. On September 11, 2001, we saw once again that such greatness lies in ordinary people like you and me who, in times of dire need or extreme peril, performed supererogational acts for their fellow human beings. My favorite John F. Kennedy quote says that countries define themselves not by the men they produce, but by the men they honor, the men they remember. Let us resolve to do more than remember, this September 11 and on every one to follow. Let us strive to live our lives as the kind of Americans whom the heroes of September 11, 2001 died to save. If we do, we can still build a world that is another principal, fitting memorial to them. You are currently browsing the Veteranscribe's Blog blog archives for September, 2011.